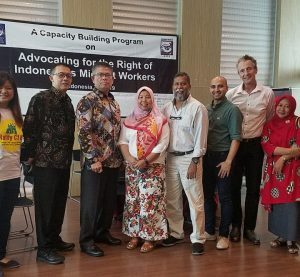 A global campaign to challenge countries to protect the human rights of migrants in the face of continued abuse and disrespect was launched to mark the 20th anniversary of the adoption by the United Nations General Assembly of the International Convention on the Protection of the Rights of All Migrant Workers and Members of Their Families (Migrants’ Rights Convention) in 1990. 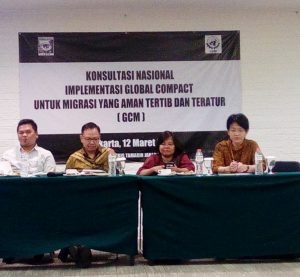 The campaign was launched by the International Steering Committee of the Global Campaign for Ratification of the Migrants Rights Convention (SC), an alliance of intergovernmental agencies and leading international human rights, church, labour, migrant and women’s organizations that support the Convention Ratification Campaign. A proposed side event on the evening of the second day of the Civil Society Days of the 4th Global Forum on Migration and Development in Mexico. As a member of the International Steering Committee, MFA produced a poster containing the important provisions of the MWC. The regional office of the High Commissioner for Human Rights in Bangkok supported the initiative and their logo can be found on the poster which was shared with other SC members, as well as with other human rights organizations. MFA planned to intensify its ratification campaigns in Indonesia and Bangladesh, and maybe even Lebanon. These initiatives were in line with the SC’s Campaign to urge all those states that have not yet ratified the Convention and seize the occasion of its 20th anniversary to send a strong message to the international community of their commitment to the protection of the rights of migrants. Other SC members include the Office of the High Commissioner for Human Rights (OHCHR), International Labour Office, International Organization for Migration (IOM), UNESCO, International Federation for Human Rights (FIDH), Amnesty International (AI), International Trade Unions Confederation (ITUC), December 18, International Catholic Migration Commission (ICMC), Human Rights Watch (HRW), International Movement Against All Forms of Discrimination and Racism (IMADR), Migrants Rights International (MRI), Public Services International (PSI), Women’s International League for Peace and Freedom (WILPF), World Council of Churches (WCC).